This is a thing. It happens. There does exist a Super Nintendo within my apartment, along with a Link to the Past, but the cables and controller are absent. I also have several NES controllers, zappers, and an Advantage, but no console or games. This entry was posted on Monday, August 16th, 2010 at 12:00 am and is filed under Comics. You can follow any responses to this entry through the RSS 2.0 feed. Both comments and pings are currently closed. yeah, history has always repeated itself, but that used to be a cycle that took centuries, not 20 years. I look forward to the cycle getting shorter, mayhap the next generation will have five, or even 2 year cycles before they’ve forgotten about the previous one. Those uncolored comics made me realize how blessed we are to have color comics. That week of black and white threw me into a spontaneous depression fit. 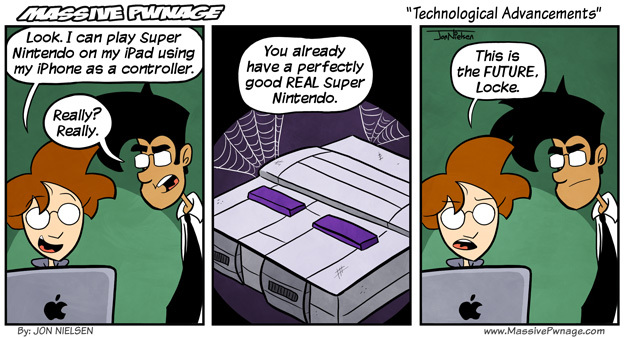 I miss my SNES, somebody stole it a few years ago. Lame. Who would do such a thing. I wonder what happened to my old one. Actually, it’s possible it’s in my parent’s basement next to the Sega… One can hope. I have an NES console & a few games but my nephew jammed a cartidge into just because he likes to break things. He even said Mario Bros is boring. *sniff* Such blasphemy. Children these days are lost. I STILL have fun with Mario. I’m sure I’ve actually beaten it, but it’s been so long that I’m not so sure. I actually own every official Nintendo console. Yes even the Virtual Boy. I’ve owned all of em at one point or another. how do you not have an NES? I have 3 and like 5 sets of wires…. I still have just about every Gameboy if that counts for anything haha.